Just a few short weeks after the death of Steve Jobs comes a 627 page biography by Walter Isaacson, the former Managing Editor of TIME and CEO of CNN. Isaacson first discussed writing the book with Jobs seven years ago and has since interviewed the Apple CEO more than 40 times. 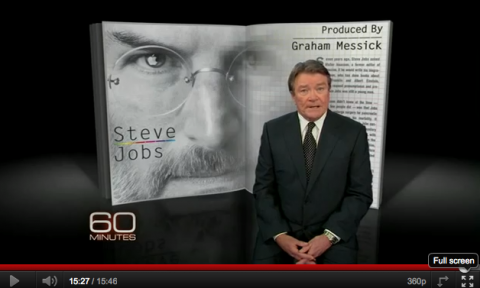 Now, appearing on 60 Minutes, he talks publicly about the new book simply called Steve Jobs. It hit bookshelves yesterday and already stands atop the Amazon Bestseller list. The 29 minute interview (Part 1 here, Part 2 here) gives you a feel for the book that's willing to tell the good, the bad and the sometimes ugly of Jobs' life. If you’re looking to get your hands on the biography, give this some thought: If you sign up for a 14-day free trial with Audible.com, you can download pretty much any audio book in Audible’s catalogue for free. And that catalogue now includes Isaacson's unabridged biography. Once the trial is over, you can continue your Audible subscription (as I did), or cancel it, and still keep the free book. The choice is yours. Note: CBS didn't allow the 60 Minutes interview to appear on external sites like ours. Hence you will need to watch the interview on YouTube itself. We provide the links above. Love to get latest interviews and documentaries whenever is possible. i would like to download the book on ,” the life history of Steve jobs or any other topics related to his great achievements.